We have been impatiently waiting for the weather and free time to fall into alignment; finally we were able to try out the new Advanced Elements AE 2040 Rapidup kayak and canoe sail on our trusty AdvancedFrame single. 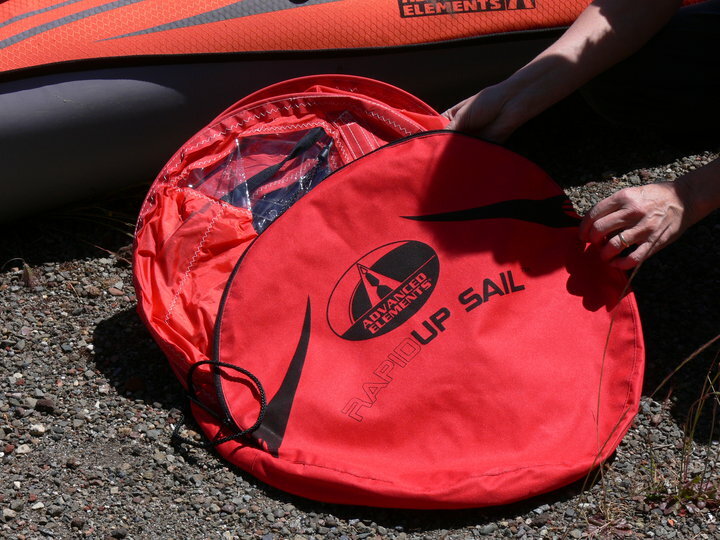 First impression – the sail is pretty compact, seems rugged and comes in its own carrying case weighing in at 2lbs total. We carefully pulled it out, quite cognizant from past experience, that if you aren’t careful they can bite you in the face. 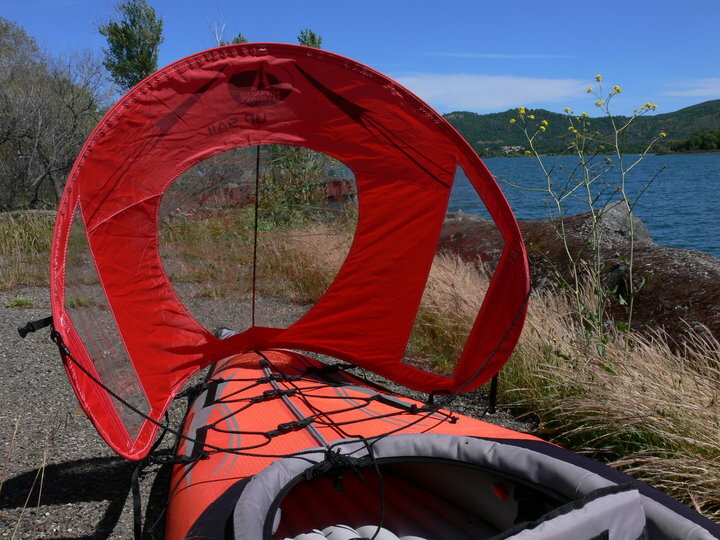 The sail shape is specially designed to conform to kayak decks, and uses a built-in non-corroding “spring” frame that gives the Rapidup the ability to “spring” open. The Rapidup is a downwind sail. Meaning, you must have the wind to your back for it to work. Knowing this, one can paddle upwind early on, and then turn around and cruise back to your launch spot. Opened up, the sail measures 59 inches across and 36 inches high. 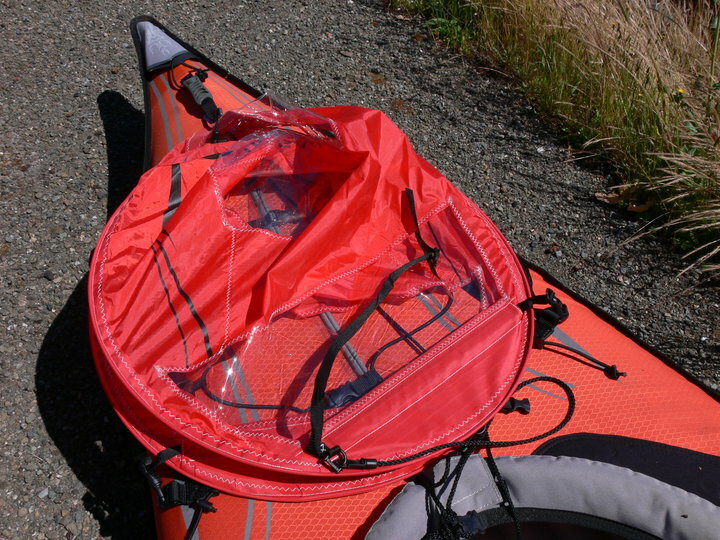 The setup is simple enough – lay the sail faceup with the bottom at the bow. Take the included carabiner (premounted in the center) and attach it to the carrying handle, then move around the kayak, clipping first the “forward snap hooks” and then the “rear snap hooks” to two d-rings on each side, for a total of four. Pull on each of the four cinches to ratchet down the sail closer to the hull. String the “dowsing” line through the handle, under the sail, and let lie loose on the floor. Then take the two side stabilization lanyards and loosely tie them to the front coaming buckle. (Editor’s note: Bone up on quick release knots, it will help immensely). To fold it down onto the deck, pull on the “take down” rope so it folds back slightly, then fold in each side. While the instructions suggest rigging up a bungee fastener, we found that by taking the one long cord located sewn to the upper right side of the sail (which when the sail is folded will be on the lower left) and then running it under the forward clip and then across to its mating fastener – this allows one to keep it in position on the deck, with no fear of it popping open at an unlikely moment. The quick release allows you to pop it up when you want. We only mounted the Rapidup on the AE1012 AdvancedFrame, but the manual details all the slight variations for each of the other models. We took out the Rapidup on two separate days – I took it out in more inclement, white-cap weather, while our buddy Alan took it out on a fairly gentle day. The sail deploys rapidly (hence the name) and can get surprisingly fast. There is a little bit of a learning curve – if you stray the sail will start flapping until you straighten out. If you suddenly feel overwhelmed, a quick tug on the dowsing line will slow you down, then quickly fold in both sides down to the hull. I managed to run up to 5mph the day I was out. The sail really shines in gentler winds – since it is ratcheted close to the hull, the sail remains in an upright position. At these times, one can get an extra boost by paddling, or just kick back and relax with an occasional “retracking” with the paddle. 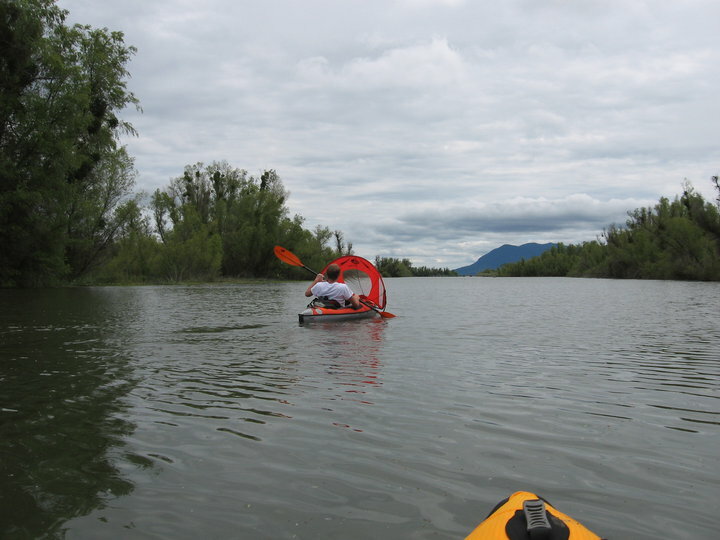 While the Rapidup is specifically designed for Advanced Elements kayaks – it works on the AdvancedFrame series, the AirFusion, the StraitEdge, the DragonflyXCs and Lagoons – I was also able to test it out on a Bic Yakkair as well as an Airis Velocity. For those wishing to use it on a different vessel, here are the dimensions – 59 inches wide, with the carabiner centered. First set of clips is 12 inches off each side of the carabiner, next set is 15 inches further. Each clip is on a tether that adjusts from 1 to 6 inches. The sail height is 36 inches. Our only problem with the sail was getting the clips back off the kayak. You need to get that “perfect” angle”- once you do, it slips off easily, otherwise you will struggle. Conversely, it’s not likely to slip off while sailing. * Comes with: 18″ storage bag, instruction manual, 2 quick connect stabilization lanyards, 1 quick connect dousing lanyard, 1 carabiner base clip. The Rapidup is just plain fun, and at $79, a price that won’t break your budget. 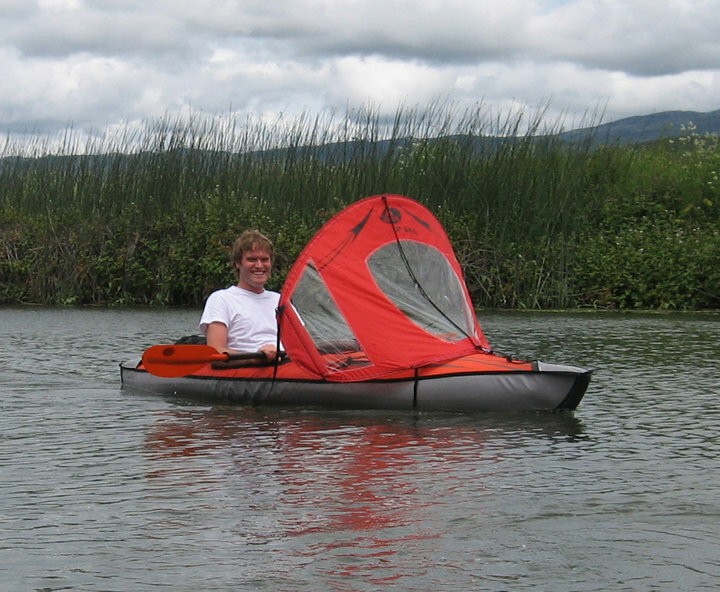 It works best on the Advanced Elements kayaks, but could be adapted to other inflatables. 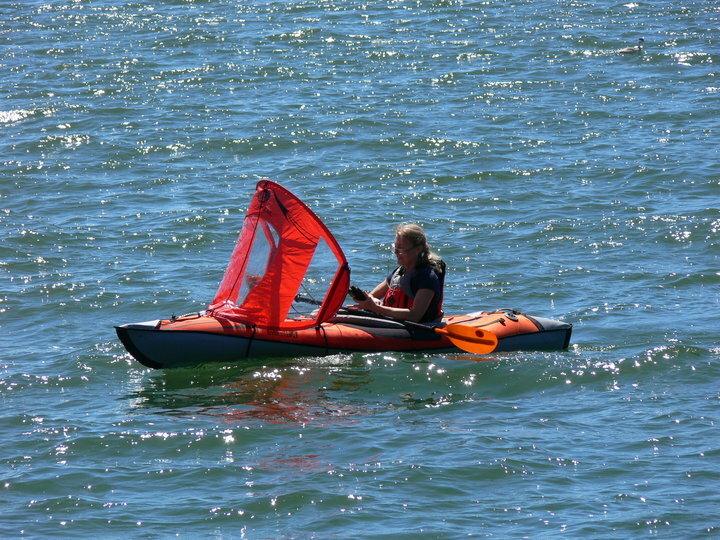 It gives you the best of both worlds – laying back and enjoying the ride, or the ability to paddle while sailing to get that “slight edge.” Simple to use and portable. 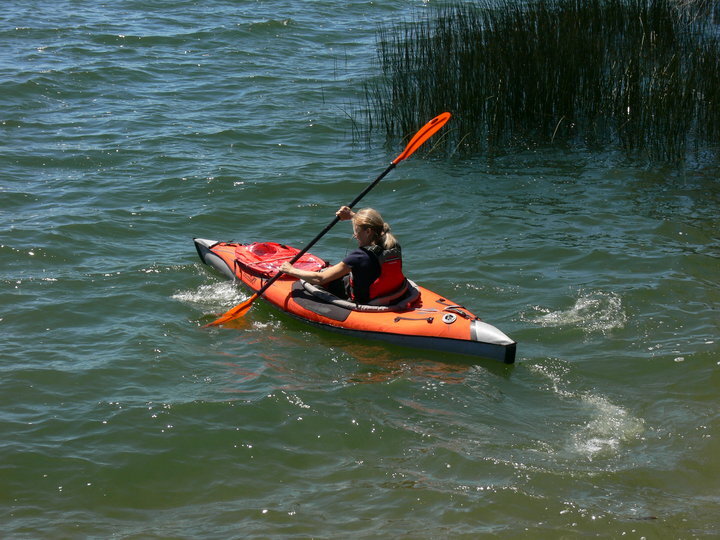 « Just arrived – last Stearns Spree kayaks, 10 left!